This website is maintained by a native Japanese speaker, Takanori Tomita, who works as a Japanese teacher and Japanese translator in Japan. He is also well known in Japan, as he write so many books and featured in Japanese magazines, radio, Internet, and TV. His passion is to spread the Japanese culture to all over the world, and let more foreginers to be interested in Japan. He also maintains the Japanese travel guide blog, and Japanese symbols translation website. What sort of Japanese lessons? For a beginner of Japanese language, we have prepared 3 type of different Japanese language lesson. If you would like to get more advanced lessons, we have NIHOGNO Japanese lessons with audio and video lesson as a package. But, first, please subscribe Takanori Tomita's FREE Japanese lessons below! If you like this lesson, please click "Like", "Tweet" or "G+1" button! I greatly appreciate your kindness! Please enter your name and emai address below to get FREE Lessons by Takanori Tomita. *This is a private mailing list and will never be sold or given away for any reason. 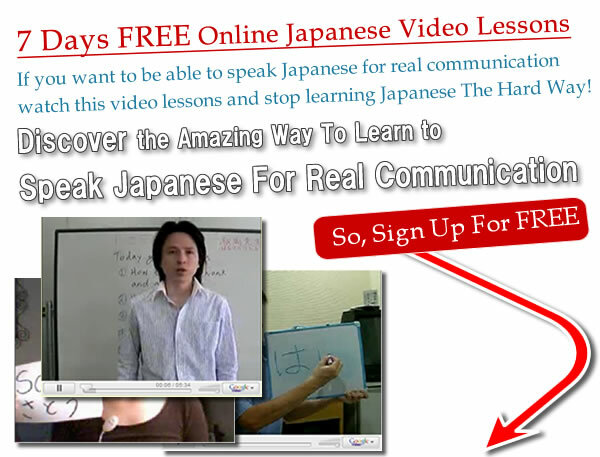 *Read what our subscriber says about the 7dasy FREE Japanese Video Lessons below. Also please write your comments as well, if you like this course! My name is Takanori Tomita. I've been teaching Japanese on the interne since 2008. Copyright c 2006 - 2016 Speak Japanese for real communication - All rights reserved.